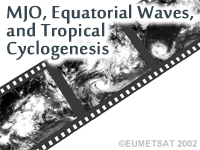 This case study focuses on monitoring of the MJO and equatorial waves and their role in tropical cyclogenesis. Learners will use conceptual models to understand the structure of the MJO and equatorial waves. They will identify and monitor those circulations using geostationary satellite images. 850-hPa synoptic analysis is used to track equatorial Rossby and mixed Rossby-gravity waves. Focus is on May 2002, a period when an MJO and associated equatorial waves spawned sets of twin cyclones over the Indian Ocean. This case study is similar to a synoptic meteorology laboratory exercise but is designed for use in an online course. Is missing the map of climatology of MJO. Hovmoller are great to visuallize. Very interactive, great exercises that apply what you are learning very directly. I do a lot of marine forecasting where I work and assess the threat for tropical cyclone development over multiple regions on daily basis. Not having a strong background in equatorial waves and the MJO, I found this comet module especially useful and educational. 2014-07-02: This module was updated for compatibility with non-Flash capable browsers.